ST. GEORGE – A surprise was waiting for boaters who entered Utah from Arizona on the morning of May 13. They were required to pull off of Interstate 15 at the port of entry just south of St. George. Then biologists and law enforcement officers with the Division of Wildlife Resources inspected their boats and personal watercraft for quagga mussels. The DWR and the Utah Department of Transportation joined forces to conduct the checkpoint. During the six hours the checkpoint was held, DWR personnel inspected 20 boats and watercraft. Two of the boats had just left infested waters in Nevada and were decontaminated on the spot. The decontamination was accomplished by giving each boat a high pressure wash with hot — 140 degrees — water. 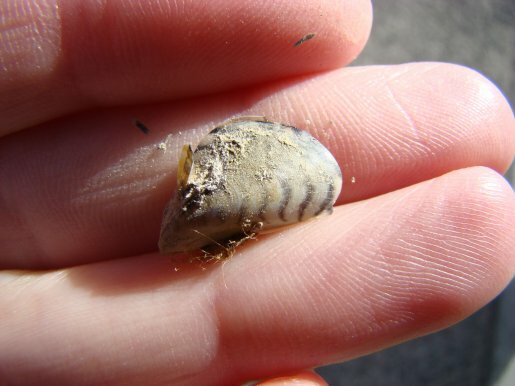 In May 2010, a single quagga mussel was found in Sand Hollow Reservoir southwest of Hurricane. Since May 2010, no additional mussels have been found in Sand Hollow or in any other water in Utah. Hepworth reminds boaters and anglers that any boat or watercraft that is placed on Sand Hollow Reservoir must be decontaminated before it can launched on another body of water. High pressure washers are available at Sand Hollow and other waters in southern Utah. Boaters and anglers are encouraged to take advantage of this free service. Quagga mussels and their cousins — zebra mussels — are non-native, clam-like invasive species. They reproduce quickly and can over populate a body of water. Once they establish themselves in a lake or a reservoir, they can clog water lines and compete with fish for available food. If you’ve boated on a water that’s considered infested with quagga or zebra mussels, you can’t launch your boat in Utah until it’s been decontaminated. You can have the DWR decontaminate it for free, or you can follow a simple clean, drain and dry process. The simple process is explained at www.wildlife.utah.gov/dwr/decontaminate.html. You can also see the three steps in a video at the DWR’s YouTube site — www.youtube.com/UDWR. Please remember that transporting live mussels within Utah or across Utah’s border into another state is against the law. It’s virtually impossible to prevent the spread of Zebra Mussels, the lake which sits at the foot of my hometown (Canandaigua, NY) is infested. The only upside is they make the water more clear!! !